The award winning BreathableBaby Breathable Mesh Crib Liner helps prevent suffocation, carbon dioxide and entanglement. Made with exclusive fabric with A.C.T. Air Channel Technology that promotes air-flow and helps maintain air access. Crib not included. I have an IKEA crib and it fits mine perfectly. Highly recommend watching the youtube installation video as installing it did not come intuitively to me. Otherwise works quite well. Did not work with my IKEA crib, as it has solid ends. Very happy with this product ! Was super easy to install and has been keeping my sons arms from falling out. Washes up super great aswell !! Great product and easy to install. Fits most cribs sizes, which is also really nice. We have an IKEA crib and it fits great. I couldn't find my instructions for how to install this, but there are loads of YouTube videos out there. Harder to figure out with solid ends on my crib but I found a video for that too and it works great! 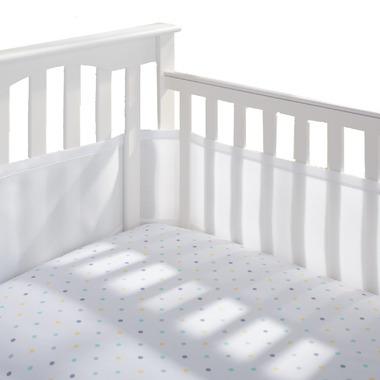 I purchased this crib liner for my grandson's crib - love them! they are easy to put in the crib and work great! Perfect blend of cushioning and breathable fabric. I am very happy with my purchase. My little one's feet kept getting stuck in between her crib bars but I didn't want to buy bumpers given the suffocation hazard. The mesh is light weight, easy to install and also provides a little bit of cushioning which is also great given that little one has also started to roll over. Super easy to install on the crib and looks nice too. The mesh does have some padding, so it provides a nice bit of cushion all around. A nice piece of mind now that our little guy is rolling around in his crib. I have the IKEA sundvik crib and it works with that style. The product comes with a little insert with options of how to install on different crib styles (whether it has bars all around or any solid areas etc.). I would definitely recommend! I really like the bumpers, it helps to keep the soothers from falling on the floor and I don't have to worry about my baby suffocating in them. I like that there are ties on the one side to tie it to the bars as well as velcro on the ends. Really happy with this product. Keeps my baby's arms and legs from getting caught between the bars of her crib. I didn't give it a 5 simply because it's a bit cumbersome to put on and remove when I need to change the crib sheets, but I suspect this might be an issue with any type of bumper pad, I just haven't tried any others before. The other thing I quite like is that it makes the crib a more cozy place for baby.